Four Mile Run Conservatory Foundation: Spring2Action with us! Spring2Action is Alexandria's day of giving for nonprofit organizations working across our community. We encourage all Alexandria residents to participate from now through April 5, in support of the many great organizations serving our community. The online Spring2Action giving platform is available starting Monday, March 20. Please consider a small contribution to the Four Mile Run Conservatory Foundation as part of your Spring2Action giving. We have a participation goal of 100 donors, giving at any level. Our focus this year is on litter removal and abatement. 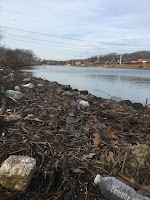 Our 'Kick the Habit' project will help reduce the too-common practice of disposable plastic bottle use, and we have applied for grant support for recycling bins and equipment to aid in removing larger trash items from lower Four Mile Run and the Park. We will have numerous opportunities for volunteers. There are already several stream clean-up days scheduled for spring--see the events calendar for details. Thank you for taking part in Spring2Action!